When parents around the world started getting Facebook, kids everywhere started panicking. Who wants mom seeing your "zomg sooOooo hungover" status or the shot of you flipping the bird to the camera? Kathy Halper has gone where few moms have gone before, however. She not only looks at her kids' Facebook statuses and photos, she embroiders them. Halper's collection titled, "Friend Me," depict images of a not-so sober generation. Captions like "Is it wrong that I'm more embarrassed about the karaoke than the toplessness?" accompany underdressed, under the influence teens. Halper was a painter for most of her adult life and was always intrigued by using the private lives of her children and their social circles for inspiration. Halper's pieces depict information that is often exhibited to everyone except the parents. 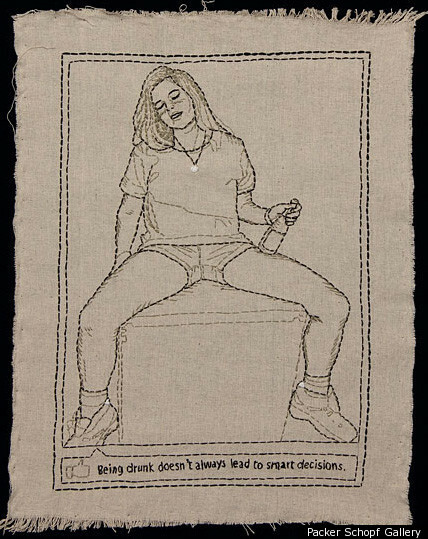 In one sense there is a complete absence of privacy in this exhibitionist craze and yet looking at these embroideries give us a sinking feeling in our stomachs, as if someone just read our diary. Take a look at the "Friend Me" collection, courtesy of Packer Schopf Gallery in Chicago, and let us know what you think. Are the images a horrifying wake up call or a good laugh?